BLU unveiled a large swath of new Android smartphones and not one of them is more expensive than $200. Yet there are premium features like super thin metal bodies, octa-core processors, LTE connectivity, massive batteries and more. A rebadged Gionee Elife S5.1, the BLU Vivo Air has an impressively thin 5.1mm chassis. Its frame is made of an aluminum-magnesium alloy and weighs under 100g. The slender smartphone has a 4.8" AMOLED display with 720p resolution and Gorilla Glass 3 protection (same glass is used on the back too). The Vivo Air packs quite a punch for such a dainty frame with an octa-core Cortex-A7 processor, courtesy of a MediaTek MT6592 chipset. It's weighed down by the limited RAM though, 1GB. The phone runs Android 4.4 KitKat nad has 16GB of built-in storage. There's no LTE though, the phone tops out at 21Mbps 3G HSPA. The 8MP camera on the back records 1080p videos while the 5MP camera on the front will shoot all the selfies your Instagram followers can stomach. Despite being razor thin, the phone has a 2,100mAh battery. The BLU Vivo Air will be available in White Gold and Black starting mid-January at $200. You'll be able to find it at Amazon and other retailers. 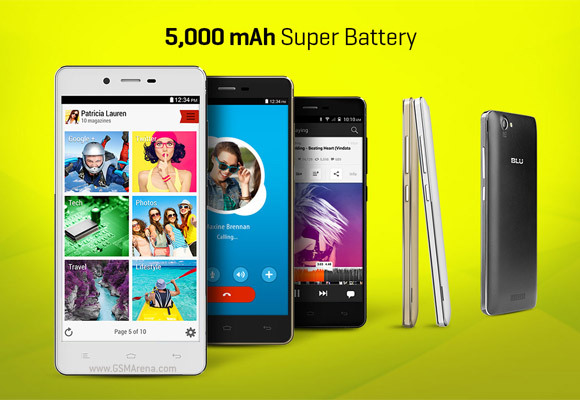 The BLU Studio Energy is a twin of the Gionee Marathon M3 and just like it packs a massive 5,000mAh battery in a 10.4mm chassis. With 4 days of estimated battery life, the phone can handle 52 hours of calls with its two SIM cards. It has so much milliamps in its battery that it can even share them and charge other devices. In terms of hardware, the Studio Energy offers a 5" IPS display with 720p resolution and Gorilla Glass. It's powered by a more modest quad-core processor (with 1GB of RAM) and runs Android 4.4 KitKat too. Additional features include 8MP main camera, 2MP front camera, 21Mbps 3G HSPA connectivity and 8GB of built-in storage (plus a microSD card slot). The BLU Studio Energy will come at the end of the month at $190 in Black, White and Gold. The BLU Life One comes in 5" and 5.5" versions, the latter is dubbed Life One XL. Both boast LTE and dual-SIM connectivity thanks to the Qualcomm Snapdragon 410 chipset (with a 64-bit processor) and run Android 4.4 KitKat. A 5.0 Lollipop update is in the works. The small one is 7.6mm thick and has a 2,420mAh battery, while the 5.5" model is 8.3mm thick and has a 2,820mAh battery. The bodies of both feature an anodized aluminum frame. The Life One and Life One XL have 13MP cameras with 1080p video capture and 5MP selfie cameras. They come with 8GB of expandable storage. The two phones will come out at the end of March, the BLU Life One will cost $180, while the BLU Life One XL will be $200. More affordable alternatives to the Life One series, the BLU Studio X and Studio X Plus are 5" and 5.5" Android smartphones respectively. The screens on both are IPS LCDs with 720p resolution. Measuring 10.5-10.6mm these two aren’t as thin as their Life One siblings. The two Studio X phones are powered by a quad-core processor and a MediaTek chipset with 1GB RAM. They run Android 4.4 KitKat at launch with a planned Lollipop update to follow. Connectivity includes 21Mbps HSPA and dual-SIM telephony. An 8MP/1080p camera adorns the back, while a 2MP snapper lies on the front. Storage is 8GB. 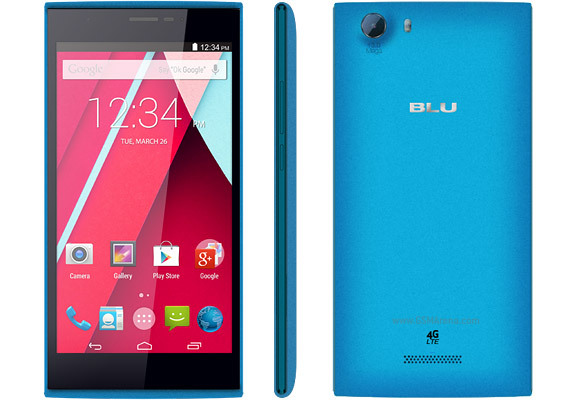 The runt of the litter is the BLU Studio G – a $90 dual-SIM phone with a 5" IPS display (480 x 854px). It has the same chipset as the previous two Studios but with only 512MB RAM. Interestingly, this one will also make the jump from Android 4.4 KitKat to 5.0 Lollipop. Connectivity is on par too with 21Mbps HSPA, while the camra department has been demoted a touch – 5MP/1080p on the back and 2MP on the front. 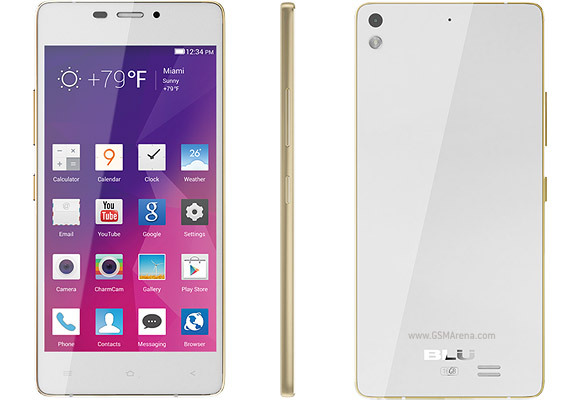 The BLU Studio G is coming out at the end of the month.